James T. Costa takes listeners on a journey from Darwin's youth and travels on the HMS Beagle to Down House, his bustling home of forty years. To test his insights into evolution, Darwin devised an astonishing array of hands-on experiments using his garden and greenhouse, surrounding meadows and woodlands, even taking over the cellar, study, yard, and hallways of his home-turned-field-station. Darwin engaged his children, friends, and neighbors as assistants and encouraged fellow naturalists to follow his lead. His inventive experiments yielded universal truths about nature and evidence for his revolutionary arguments in On the Origin of Species and other watershed works. We accompany Darwin in his myriad pursuits against the backdrop of his enduring marriage, chronic illness, grief at the loss of three children, and joy in scientific revelation. 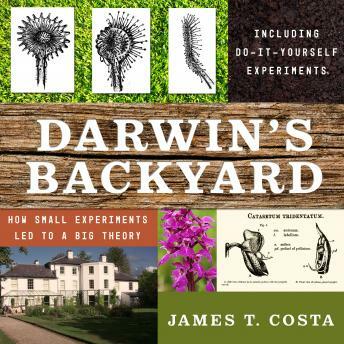 At each chapter's end, Costa shows how we too can investigate the wonders of nature at work, with directions on how to re-create Darwin's experiments.